One of the pioneers in this policy of trying to get a foot into new market segments is Mercedes-Benz. Within the last ten years the company extended its lineup into the small car, SUV and the super luxury class. Actually the smallest (the ‘smart’) as well as the largest (the Maybach 62) German series production cars are built by Daimler-Chrysler companies, although for marketing reasons these cars are not sold under the Mercedes brand. Well, the ‘smart’ is not really German, being produced in France and not even a car by American standards... But that’s another story - and another Revell kit. But back to our subject. The first step for Mercedes was to enter the most important car class in central and western Europe - the ‘compact class’. Also named the ‘Golf’-class in Germany - after the VW Golf - which is (now in its fifth incarnation) the best selling car in Germany for more than two decades... Mercedes engineers and marketing people soon realized that building just another Golf/Megane/Civic/Corolla would not do the job and went on to create a car which would establish it’s own class somewhere between small station wagons and small van - the ‘compact van’. Having similar external dimensions (except for height) as a normal compact car, the higher body and intelligent arrangement of engine and transmission components allow for a roomy ‘van-like’ interior with higher seat positions. This concept proved to be successful - as can be seen by the fact that many companies offer similar cars these days - from the Audi A2 (which is conceptually very similar) to the Volkswagen Touran, the Renault Scenic or the Honda Jazz which are somewhat larger and based on the companies compact models. Since the car was the smallest Mercedes it got the designation ‘A-Klasse’ with the C-class being the next larger model. 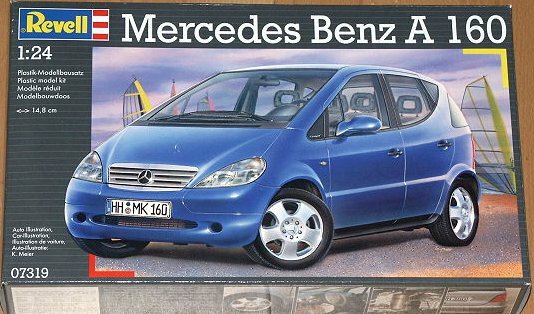 The Revell kit represents a 1998 A 160 ‘avantgarde’ model with sunroof. Since the external appearance of the car didn’t change much in the last years except for headlight and taillight configurations it should be no big problem to convert it into a newer model. It comes in one of the typical side opening cardboard boxes Revell uses these days. The box is somewhat flimsy and to large for the model of such a small car. 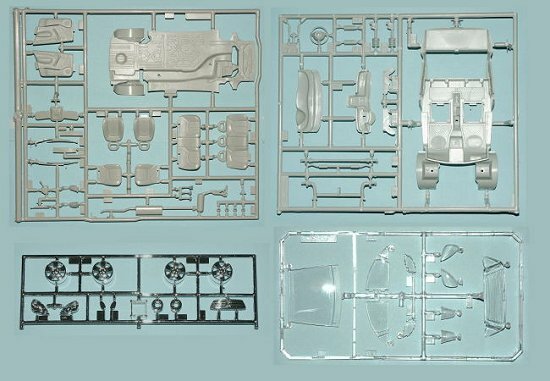 It contains the car body in white plastic, two light gray, one clear and one chrome plated sprues and four vinyl tyres (sorry these are missing in the photos) - all in all about 65 parts. 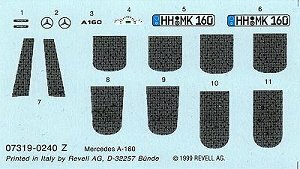 A small decal sheet contains instruments, external decorations, German license plates (for a car registered in Hamburg) and decoration for the seat cover materials. The molding quality is good although some details are somewhat soft and the gray parts show some flash. The clear parts are nicely done but most of the chrome plated parts are somewhat soft in detail and of questionable use. The wheel rims on the original are not chrome plated but light metal alloy and therefore have to be painted anyway. The kit itself is a curbside type of kit - so no engine is provided. Otherwise detailing is nice with suspension components, brake disks and a nicely detailed interior. This will be a fairly easy and fast build. Dry fitting revealed that the fit seems to be good with one exception. The clear parts for the rear windows have the correct size and shape but unfortunately not the right curvature. It will be quite a challenge to bring them to confirm with the body - without marring clear parts or already painted body with glue. The instruction sheet is typical Revell with first pages giving safety and general construction remarks in at least twenty languages, then a sprue layout plan and then construction sequence broken down into fifteen steps. Painting instructions are given for Revell/Germany paints (what else...). Only one paint scheme is given (dark metallic blue) but it’s probably not a big problem to find color information at your nearest Mercedes dealership or at the Mercedes-Benz web site (at least for the actual models). It’s nice that some companies make models of ‘everyday cars’. Not the Ferrari or Porsche you will probably never own anyway, but the Mercedes A-Klasse, Volkswagen Golf or some of the other cars you see every day on the streets. 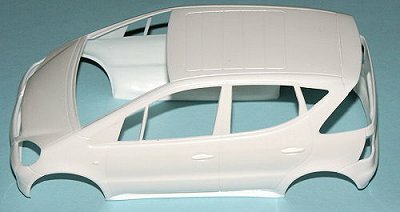 And - except for the poor fitting clear parts - this will be a fairly easy build resulting in a nice and unusual model of an important car. Thanks to the EPMC Dresden and Revell Germany for the review sample.